Snoop Dogg and T.I. perform during Tupac’s Rock and Roll Hall of Fame induction. The 2017 Rock and Roll Hall of Fame induction ceremony, which airs tonight on HBO, opens with a tribute to the god of the institution: Chuck Berry. Forgoing the usual jump into the evening’s routine of speeches alternating with performances, the Hall instead memorialized the late rock pioneer at the start of the show with a short documentary and a performance from ELO’s Jeff Lynne (an inductee that night). Berry’s immeasurable contribution to rock history — he invented its aura and attitude — was writ large in the footage. But as one of the few people of color attending the event that night at the Barclays Center, I found the irony permeating the room glaring: Berry’s blackness had been almost entirely erased from the narrative by the Hall, which was built on the back of his career. With rock music, it’s easy to rewrite history. Black artists like Berry and Sister Rosetta Tharpe — who’s still not a Hall of Famer, while Berry was inducted the inaugural year — gave the genre its legs. Then white artists walked away with it. This year, the Rock Hall inducted two more black artists into its canon, giving Nile Rodgers the Musical Excellence consolation award (after snubbing Chic 11 times) and inducting Tupac Shakur the traditional way. But unlike Berry, and so much of the black art accepted by the Hall, Rodgers and Shakur made disco-funk and hip-hop, two genres that white artists have historically struggled to co-opt. 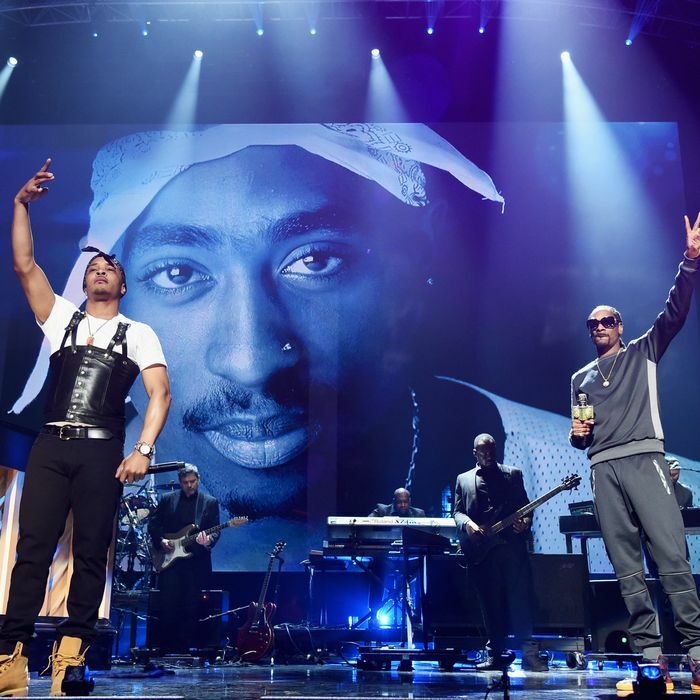 It’s the first time since 2013 that more than one black act has been inducted into a single Rock Hall class; and Shakur is also only the sixth rap act to ever be inducted. To anyone at the show’s taping earlier this month, it’s evident rock’s gatekeepers still haven’t figured out what to do with a genre they didn’t foresee but would one day demand to be acknowledged. Following his own induction, KISS’s Gene Simmons made clear his thoughts on who the Hall shouldn’t be for: “If you don’t play guitar and you don’t write your own songs, you don’t belong there,” he said. He then went to war with N.W.A, who were inducted last year, telling Ice Cube, “Respectfully, let me know when Jimi Hendrix gets into the Hip-Hop Hall of Fame. Then you’ll have a point.” It’d be simpler to think of Simmons’s comments as the isolated opinions of an aging rock star out of touch with both the music that blossomed alongside his own and the genre that dominates music today, both commercially and critically, if it didn’t also stink of racism. And to do so would ignore the reality: Simmons’s opinions align with too many involved with the Hall. I watched act after act take the stage at the ceremony this year, from ELO to Joan Baez, and, with every folk and rock star of yesteryear, the applause grew. The mood changed when a montage about Tupac began to roll. Snippets from his famous interview with Tabitha Soren played on the big screen, followed by flashes of his booming voice on “California Love,” and the other hits from his tragically short career. It should’ve been a moment of reverence — a rap titan who had changed the face of hip-hop by the time he was 25 years old, was being awarded one of music’s great honors. Instead the moment was met with a mass exodus. Throngs of people in the audience, particularly those seated in the sold-out Barclays stands, bolted for their first bathroom break of the night, just as Pac’s voice echoed through the arena in the clip’s first seconds. The reception only worsened when Snoop Dogg walked onstage to induct his late friend and Death Row Records brethren. To Snoop, whose line of vision probably best met the celebrities in front of him, it might’ve sounded like a warm welcome. His peers in the front stood and cheered, as did many others at the tables on the floor and in the high-priced stands. Widen the scope a bit and put a spotlight down the sides and toward the back, however, and he might’ve seen that the crowd had visibly thinned. For the first minutes of his speech, Snoop was drowned out by the racket of people spilling out between the tables in the rear to chat over his speech. According to another Vulture writer who spent the night in the press room, the reaction there was the same: A predominately white sea of men and women — but mostly men; this is the Rock Hall, after all — were disinterested in the blackest moment of the night. In his speech, Snoop unknowingly nodded to this hypocrisy, taking umbrage with the way Pac’s legacy has been distorted in death. How he’d become a thug deity, an image on a Forever 21 T-shirt instead of the multifaceted black man that he was in life. “While many remember him now as some kind of thugged-out superhero, Tupac knew he was only human,” Snoop reminded the crowd. He humanized Pac by sharing colorful stories of how they defied societal expectations for black men by relishing their wealth and freedom with oddly normal frivolities like parasailing. Had an older white journalist at my table — one of the few nearby who came prepared to cover rap — not shushed the clusters of loudmouths surrounding us, we might’ve missed Snoop tell one of the best stories of the night. Alicia Keys was the first to perform in Pac’s honor, singing a medley that included “Changes” from her usual seat at the piano. The bathroom-goers who’d since returned knew her well enough. Their interest, though, still wasn’t piqued. Bringing respected West Coast rap newcomer YG on next didn’t help either. It was then that my otherness started to show — against my better judgment, I stood up and danced. I outed myself as a fan. If any of the other white men at the table — save for the one who previously hushed the unruly audience members — had a clue who YG and, later, Treach and T.I. were, they did a good job of playing dumb. Those nearest turned to the only black girl in sight and started asking me to ID the rappers onstage for their reviews of the ceremony when furious Googling failed them. Unfamiliarity with unannounced guests isn’t a crime. But if we’re going to induct rap into the Hall, then the Hall and those it invites to witness the ceremony ought to dignify the art first. Nile Rodgers, whose speech was also talked over, had to put dollar signs on top of his résumé to prove his worth (“I’ve sold over 300 million albums and 75 million singles,” he said.) For all the others among his class, the accolades were assumed; their history isn’t allowed to be ignored. If we’re to hold up the Rock Hall as a time capsule containing all the artifacts of music’s past that we’d like the future to remember — and that does appear to be its logical purpose — it matters whose culture we’re preserving, and how. If the only black art that Hall purists care to see has to look like Chuck Berry’s, we’re in trouble.